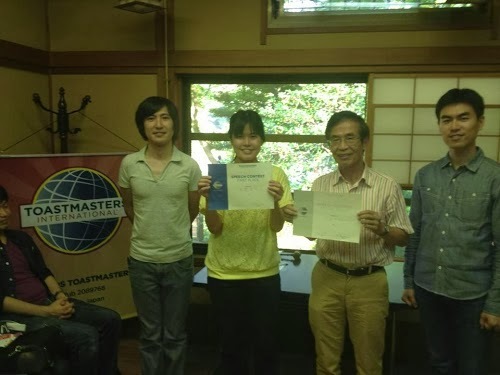 The first official Contest of this club was held on 21th September. This club is an English Club, however, the contest was held both in English and Japanese. 5 contestants attended English Contest. Their topics are about a Samurai, a pretty pet, the retirement of sumo wrestler, a special boyfriend, and John & Yoko. They made great stories beyond our imagination, and they really entertained the audiences. The venue was Kantoku-tei which is located besides the well-known Japanese Garden, Koraku-en. We could see a beautiful garden from the window. 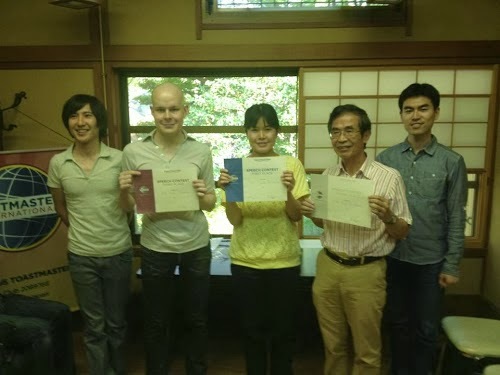 As for the Japanese part, 3 contestants attended. This time, the speech topics were about a pigeon, a love story lasting a millennium, and a story about a doppelganger. Each stories are also impressive. After contest session, the Interview session started. Every speaker gave creative answers drawing from daily news, their own experience, and work. Finally, Award presentation started and TM W. won both English and Japanese Contests ! However, she didn't accept the offer to go for the area contest(due to a perticular reason :-), TM Kato was elected to next contest ! We wish the best of luck to him as Cosmos TMC members.